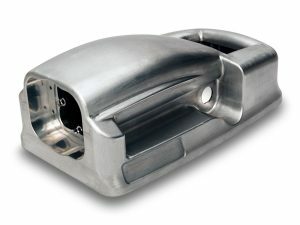 Quality has been the top priority since Bob Lewis machined his first part in 1975. Since then, many things have changed at Bob Lewis Machine Company but one remains throughout the years: Their total commitment to top-quality precision machining. Bob Lewis knew that the secret to long-term success in the contract machining industry is reliability, and the key to reliability is quality. Today, Jeff Lewis continues the tradition of total quality throughout the entire organization from material ordering to final inspection and shipment. Every aspect of the manufacturing process at Bob Lewis Machine Company is carefully controlled with the goal of 100% quality and on-time delivery. At Bob Lewis Machine Company, focus on quality is not just a phrase … it is a tradition. 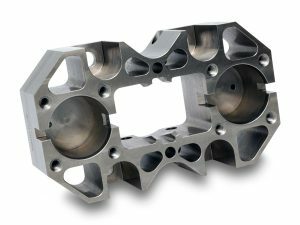 Bob Lewis Machine Company has a CNC programming department that is second to none in the precision machining industry. Six networked computers running Feature CAM 2011 Mill and Lathe, E2 Shop System Software, MasterCam, and Virtual Gibbs with 3-D capabilities provide optimal support for our sixteen late-model CNC machining centers; including state-of-the-art, 5-axis machining with contour capabilities. At Bob Lewis Machine Company we work with customer-furnished digital data sets to maximize our machining efficiency and minimize the chance for errors. We can translate most standard file formats including: solid files, IGES, dxf, step files and AutoCAD. State-of-the-art CNC programming is your guarantee of top-quality precision machining and customer service from Bob Lewis Machine Company. Bob Lewis Machine Company has developed the habit of taking on the tough jobs that no one else wants to do. “We like a challenge,” says Jeff Lewis. 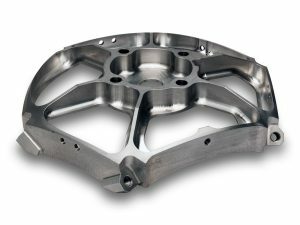 “We have the talent and the resources to tackle parts and assemblies that other shops will not even quote.” Resources that include a state-of-the-art programming facility, modern CNC equipment and a total commitment to quality and customer service by everyone in the organization. Combined with twenty-five years of precision machining and assembly experience, there is very little that the people at Bob Lewis Machine Company cannot handle. Put our team to work for you and let us show you what complex precision machining and assembly is all about. You will be amazed at what we can do. Bob Lewis Machine Company is proud of its people and knows how to attract and keep the best in the business. Top-notch employees are the force behind Bob Lewis Machine Company’s reputation for quality and customer service. Experience it for yourself. Bob Lewis started his company in 1975 in his garage in Torrance, California. With a Bridgeport Mill, a Chucker and three drill presses, Bob got his big break with a supplier approval from AirResearch. He then moved Bob Lewis Machine Company into its own 5,000-square-foot building in 1980 and began to build his company into a modern manufacturing powerhouse. For the next several years, Bob Lewis Machine Company acquired new customers and focused on quality and customer service. 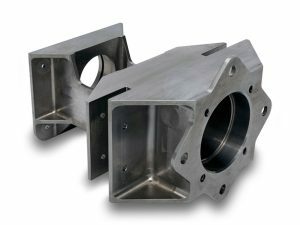 More equipment was added, including CNC machines, to keep up with the growing customer base and demand for high-quality, precision-machined parts. 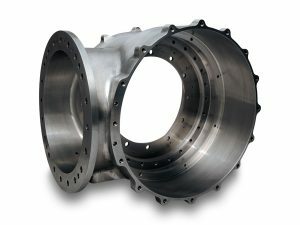 From the very beginning, Bob Lewis Machine Company has focused on quality and reliability, building a reputation for excellence in the contract machining industry. Jim Shiffert began working at Bob Lewis Machine Company in 1983. Jeff Lewis came on board in 1991 after four years of college and a year off to work on a fishing boat. Both Jim and Jeff moved up in the company from the shop floor, learning every aspect of the contract manufacturing business along the way. In early 2001, when Jim and Jeff took up the reins of day-to-day management, Bob Lewis retired from the company he founded twenty-five years earlier. The future at Bob Lewis Machine Company is bright. “We are building on a solid foundation of more than forty years of quality precision machining,” says Jeff Lewis. “Bob Lewis Machine Company will maintain its tradition of high-quality, precision machining while we will continue to evolve from the traditional machine shop into an ultra-modern, full-service manufacturing facility for the commercial and aerospace industries.” Discover what many major aerospace companies already know — Bob Lewis Machine Company is your best source for top-quality, precision manufacturing in the 21st century. We are pleased to announce that Bob Lewis Machine Company has received certification as a Qualified HUBZone Small Business Concern. The U.S. Small Business Administration’s HUBZone program was created in 1998 and is designed to promote job growth, investment and economic development in “Historically Underutilized Business Zones” or HUBZones. As a HUBZone-certified manufacturer Bob Lewis Machine enjoys limited competition in the form of set-aside contracts, price evaluation preference in open-bid contracts, and other competitive advantages when bidding for Federal contracts. Increasing our business volume through HUBZone certification also means hiring more people, investing in new equipment, and contributing to overall economic growth in our local community. For more information about our new HUBZone certification please contact us. Bob Lewis Machine Company has received certification to the Quality Management System standards AS9100D and ISO 9001:2015. These new standards are more comprehensive than previous versions and involve nearly every aspect of our company management system. Designed for the aviation, space and defense industries, AS9100D & ISO 9001:2015 build on previous versions with an emphasis on: Product Safety, Counterfeit Parts Prevention, Risk Management in Operation Processes, Individual Contributions to Product Quality and Safety, and Business Ethics. 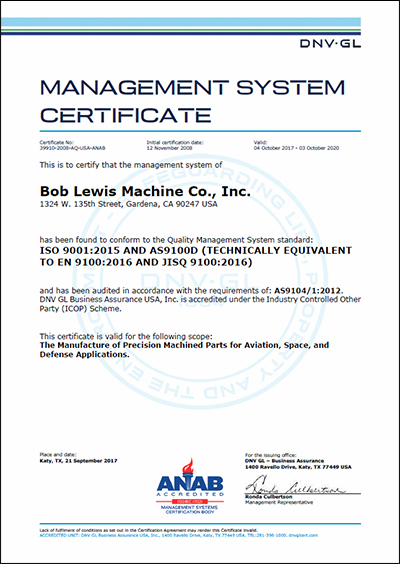 Bob Lewis Machine first achieved certification to the AS9100 & ISO 9001 standards in 2008. During the past decade, the entire Bob Lewis team has worked continuously to improve our processes and refine our management system; and to uphold our industry-wide reputation for excellence. As we build upon the past and look toward the future, you can count on Bob Lewis Machine to remain at the forefront of the precision machining industry with ultra-modern manufacturing facilities and award-winning quality and customer service. Joe Uribe Jr. Wins Rayovac FLW Series Western Division! 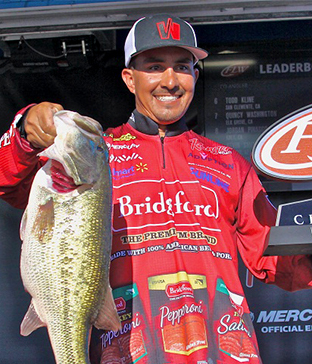 Joe Uribe Jr. won the Rayovac FLW Series Western Division event on Clear Lake with a three-day total of 15 bass weighing 66 pounds, 10 ounces. For his victory, Uribe earned $28,851 and a new Ranger Z518C with a 200-horsepower Evinrude or Mercury outboard motor. The win also clinched the FLW Series Western Division Strike King Angler of the Year (AOY) title for Joe. After winning the first tournament of the year on Lake Havasu in February, Joe backed it up with a sixth-place finish on the California Delta in May. In just three tournaments, the man known by many competitors as “Little Joe” racked up more than $160,000 in earnings, including two new boats. “I am on cloud nine right now,” said Joe. “…to get the win by just one ounce, wow! I am absolutely blessed – God is good,” Joe will now begin preparations for the Rayovac FLW Series Championship, held in just two weeks on the Ohio River in Paducah, Kentucky. Bob Lewis Machine Company is very proud to sponsor Joe and we’re proud of his accomplishments so far this year. We wish him the best of luck in Kentucky. Read more about Joe’s win at flwfishing.com. Joe Uribe Jr. Wins FLW Lake Havasu Rayovac Series! 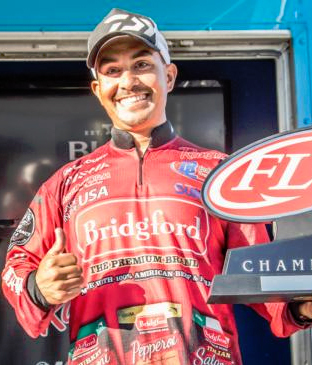 Joe Uribe Jr. won the first-place trophy in the FLW Lake Havasu Rayovac Western Bass-Fishing Series held at Lake Havasu, Arizona, February 5-7, 2015. Bob Lewis Machine Company has sponsored Joe since 2010, and he often finishes near the top in these super-competitive events held all over the western United States. “This is one of my biggest accomplishments.” says Joe of his latest victory in the Lake Havasu event. His total catch over three days was more than 67 pounds of bass – including a mammoth 26-07 stringer on the final day – blowing away his nearest competition by nearly 15 pounds. Joe turned pro back in 2003 and won the Western Outdoor News event that year. Speaking about his Havasu victory, Joe explains: “This year, the fish were definitely in pre-spawn mode. They were moving up in waves and I could tell in the areas I was fishing, they were replenishing. The largemouth were waiting in the shallow grass beds. They were all super healthy fish.” Everyone at Bob Lewis Machine Company is proud of Joe’s latest accomplishment, and we wish him the best of luck in his upcoming competitions. Read more about Joe’s win at bassfan.com. Bob Lewis Machine is the subject of an article in Modern Machine Shop magazine entitled “CNC Programming Software Maximizes Five-Axis Capability.” The May, 2013, article describes the benefits of our two 5-axis CNC machining centers working in concert with our new CNC programming software including: reduced programming, set-up and cycle times; more efficient use of customer-furnished digital data sets and; a sixty-percent reduction in delivery times. Bob Lewis Machine is proud to be on the cutting edge of modern machining technology. Our continuing investment in the latest machine tools and software keeps us competitive and saves you time and money. Contact us to learn more about the hi-tech machining environment at Bob Lewis Machine. You can read the entire article online at MMSOnline.com.